The Milfontes Tourism Fair was established in 2007 in order to stimulate and promote the town outside the traditional high season period. 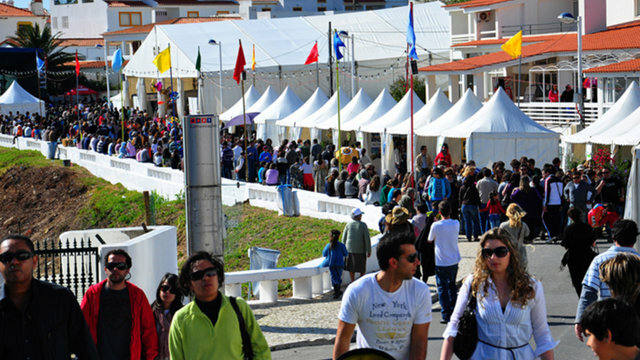 The Milfontes Tourism Fair is able to join cultural, musical and sports events. With this particular characteristic in mind, the Tourism Fair immediately became a success, promoting a different energy to the town. To local associations and businessmen, the Tourism Fair is a great opportunity to showcase and promote their very own products and services. In an effort to involve the whole town for the Fair, it is held in various locations in Vila Nova de Milfontes. Emblematic places of the city, such as the Barbican, the Marginal Avenue, the Pier and the Beach serve as stage to the event, which each year receives thousands of visitors. In 2012, the Milfontes Tourism Fair changed its name and is now called FEI~TUR – Fair of Active Tourism and Sport of Milfontes. With this altercation, the organizing party tried to promote a new image to Vila Nova de Milfontes, showing a different and new way to stimulate tourism. With the Fei~Tur, visitors can do a lot of activities: canoeing, surfing, boogie boarding, rock climbing, mountain biking and cycling. Parallel to the event, the town receives sports events like the Milfontes Bech Tennis Open, the Kayak Sea National Championship and Beach Football. But the Milfontes Tourism Fair doesn’t only live in this active and sporty mood. The program combines musical performances by traditional groups, and performances of foreground edges, like Virgin Suta, Nu Soul Family and No DJs In Antena 3. Throughout the whole event, the nightlife in Vila Nova de Milfontes catches a new breath, earning a frenzy which resembles the past Summer evenings. We are still waiting for the program of the Tourism Fair of Vila Nova de Milfontes. When available we will publish it.